MERCURY regulators are easy to install, due to the fact that gas, air and water connections are in the same direction and close each other. High heat exchange surface guarantees the full LPG vaporization, in any operating condition. 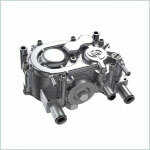 The Mercury 02L has a solenoid valve with filter at reducer inlet. This avoids to have overpressure inside the reducer, when switching from gas to gasoline. The installation of any filter, in the liquid LPG line, is avoided.